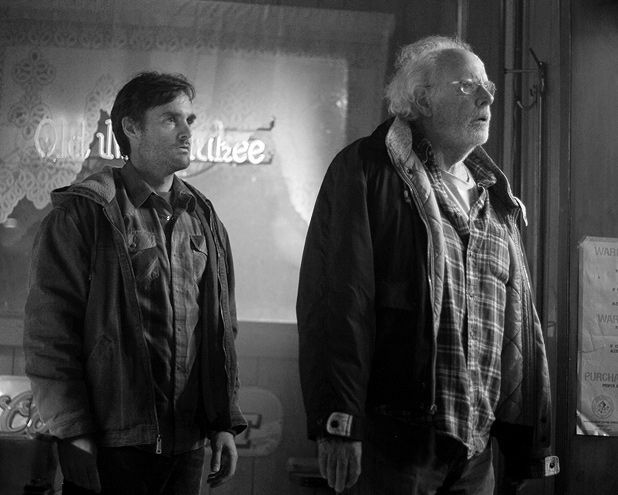 Alexander Payne’s sixth film Nebraska feels like it could only have been made by him. Returning to the state where he grew up, and where he set his first three films, it’s also the third road movie of his career, after Sideways and About Schmidt. Like the latter, which had Jack Nicholson’s crabby retiree hitting the road to make amends with his estranged daughter, Nebraska deals with an aged character and his offspring. In this case, we meet Montana resident Woody Grant (Bruce Dern), whose curmudgeonly behaviour makes Nicholson’s Warren Schmidt look positively sunny. When he receives a junk-mail flyer claiming he’s won a million dollars, as long as he collects in person, he infuriates his disbelieving wife Kate (June Squibb) and two grown-up sons David and Ross (Will Forte, Bob Odenkirk) when he resolves to make the trip to Lincoln, Nebraska to do exactly that. Deciding to drive him, David sees it as a chance to patch up their relationship. What follows is touching, thankfully lacking About Schmidt’s dead-eyed cynicism, but it’s a story also mercifully free of the cloying sentiment that clogs up most Hollywood melodramas. Shot in beautiful black-and-white, it feels like it’s been mailed direct from the 1970s – akin to Peter Bogdanovich’s The Last Picture Show – with its portrayal of an economically-depressed small town America. This feeling is further emphasised by the casting of the veteran Dern, who won Best Actor in Cannes for his work here, giving a warm, wild-eyed turn that far outstrips anything he’s done in years. Good, too, is Saturday Night Live regular Forte in the role of the put-upon son who learns to appreciate his father afresh. For all their squabbles, it’s probably Payne’s most poetic work yet, a quiet, subtle study of the highs and lows of family life. Limited release from Fri 6 Dec.